87% of rural LGBT students reported being verbally harassed, 45% reported being physically harassed and 22% reported being physically assaulted at school in the past year because of their sexual orientation. 68% of rural LGBT students reported being verbally harassed, 31% reported being physically harassed and 16% reported being physically assaulted at school in the past year because of their gender expression. Rural LGBT students who experienced higher levels of victimization were less likely to plan to attend college than students who experienced lower levels of victimization (85% vs 93%). 27% of rural students reported having a GSA at school, compared to 55% of suburban students and 53% of urban students. But when there was a GSA at school, rural students were more likely to attend than urban and suburban students. Rural LGBT students reported feeling less safe than students in suburban and urban areas and rural students living in the South and Midwest were more likely to feel unsafe based on sexual orientation than were students in rural areas of the Northeast or West. Rural LGBT students were more likely to feel unsafe at school due to their sexual orientation (71% vs. 62% of suburban and 58% of urban school students) and gender expression (49% of rural students vs. 42% of suburban and 42% of urban students). Overall, our LGBT students in rural and small communities need additional supports and resources. One of the more interesting findings of this report, however, is with regards to school counselors. 52% of rural students felt that they would be comfortable talking to a school counselor about LGBT issues, higher than any other school personnel, including teachers, administrators, and other support staff. In fact, even in suburban and urban districts, students felt that school counselors were the go-to people with regards to conversations about LGBT issues. However, as the report discusses, students in reality are bringing up LGBT topics most with teachers, not with counselors (source: www.glsen.org). This information, I believe, tells us two things. First, that we as school counselors need to be trained in working with LGBT students and families: What Is Your LGBT IQ? LGBT students across the board feel that we are the people they are most able to seek out to talk about these issues. If you are a counselor at a small or rural school, seek out trainings at local, state, or national conventions. Many school counseling conferences now feature sessions on working with LGBT students and families. You can also look at webinars on LGBT topics sponsored both by ASCA as well as GLSEN. Secondly, we need to consider ways to let students know that we are a safe-space for them to have these conversations. This can be done by sponsoring or making a visit to your school's Gay-Straight Alliance (GSA) or by posting a Safe-Space sticker somewhere in your office. As the data in this report tells us, this is an issue of academic performance, post-secondary outcomes, school safety, and attendance. By addressing this issue, you are helping to remove barriers to academic success for all students. Read the full report here or view the webinar. As we all have been, I have been deeply saddened and shocked by the events of Friday morning. As school counselors, we all tend to be fairly empathetic, and so my thoughts have constantly been turned to the parents of those children who have been lost, the families of those school staff members who died, and to the larger community of Newtown who will need support long after the media trucks and national focus have left as the depths of grief, loss, and trauma begin to manifest themselves in the months to come. Many years ago, when I was still teaching, I was at a school where, for the first time, I had to go through a lockdown drill with my students. In going through the procedures of covering my window and trying to keep 30 energetic 7th graders quiet as security came by to check that our door was locked, the thought flashed through my head, "What if this was real?" Instinctually, I immediately knew that I would put the kids into the instrument storage closet (I taught this choir class in the band room) and would put myself outside if need be to protect those kids. This was not a question I wrestled with, this was not something where I thought about all the possible consequences. I knew what I would have to do in the breath of an instant. Perhaps for this reason, I keep thinking the most about the principal and school psychologist who attempted to stop the gunman as well as the 1st grade teacher who hid her students and gave her own life to protect them. When you go into education as a career, you do not necessarily think that you may have to give your life as part of your profession. Yet, that is what the six adults who died on Friday did. I think all of us who work in schools know that when it comes to the safety of our students, dare I say, "our kids", that chances are pretty high that we would do the same. Our educational professionals have taken quite a few hits in the public arena in the last decade. However, the vast, vast, vast majority of adults in schools that I have met in the last thirteen years are highly committed individuals who work excessively long hours, nights, and weekends, often making difficult choices between their own work and personal lives. They are in education because they love kids, they love watching kids learn, and they love helping to facilitate that process. They would do anything for their students, and I think we should take a moment to really acknowledge just what that could mean. I have been inspired in the last several days by the school counseling community and their quick response with regards to sharing resources so that we all have support in working with our students, families, and school communities through this time. The mother of all school counselor bloggers, Danielle Schultz, began to collect resources at School Counselor Blog and share them with her followers. I am inspired by this, and believe that all of us who are school counseling bloggers have a responsibility, as collectors and sharers of information, to have these resources at hand to share with our followers whenever they are needed. As such, I have created a page on my blog dedicated to crisis resources, and would love if other bloggers did the same, so that no matter where a school counseling professional turns, they find information to support them in their work talking to students, staff, and families in these difficult moments. In this way, as school counselors we can continue to be prepared to lead in times of great challenge. Loss: In the documentary, one family has to take their young girl's dog to the pound as they can no longer afford to keep her, plus they are moving from a house into a hotel room where they can only have one pet. Children in poverty are constantly having to say goodbye, whether it is to their home, friends in a neighborhood they are leaving, pets, or even family members. Hunger: Almost every child talks about being hungry at points in the program. We know that children who are hungry do not perform as well in school, thus we have a national school breakfast and lunch program. However, those programs only go so far, and are not always able to address meals outside of school and on weekends. Thus, while a student may be full and able to focus in school, homework to be done on the evenings and on the weekends may be more of a struggle, as children need a lot of nourishment through their growing years. One program that is highlighted is a backpack food program where kids get food on Friday that can fit into their backpacks to take home over the weekend. Educational Impact: They do not really get to this until the end, but if you have worked in a school long enough, you have probably observed this directly. Kids in poverty are often moving around, as they are able to get into a house but are then evicted, move into a hotel, back into a house, then an apartment, etc. Thus, they can be in one school or school district's boundaries one minute, then in another one the next. One of the young girls in the documentary does not go to school for a few weeks, knowing that they are in a hotel for only a short time and will be moving into another housing situation, which puts them in a different school district. Thus, kids in poverty run a higher risk of missing pieces of their education while they move around, even if it is within the same general area. It is vitally important that you check with your school system to see what provisions have been made for students that may fall into the category of homeless. There are Federal guidelines for homeless students that clearly define what constitutes a student as homeless as well as guidelines for specific concerns such as registrations, transportation, and looking out for the "best interests" of the students in these particular situations. Educational Aspiration: Several of the kids in this documentary speak to the fact that they know, even at the young ages of 8 or 9 years old, that education is their ticket out of poverty. They look to school and good grades as a pathway to college and a good job. As school counselors, we are tasked with helping all of our students succeed academically and move on to a post-secondary option that is congruent with 21st century skills and careers. This is reassurance that our children in poverty expect and deserve no less from us than any of our other students. This is the first in what will be a series of reflections on the RAMP process. It is 4:30 p.m. on a Tuesday afternoon. School ended at 2:05, and I am knee deep in action plans, program goals, and annual agreements. Where did I put the latest version of the Small-Group Action Plans? I am writing out my 6th e-mail in 3 hours to our Student Information Assistant asking her to pull more data from the computer system to help better define our achievement gap goal. Thankfully, she is a genius, and quickly sends me another Excel spreadsheet filled with numbers. Our data-collection year has begun--RAMP is on! Do I have enough coffee for this? Judging by the buzz in school counseling circles, interest in RAMP (Recognized ASCA Model Program) is exploding. Local and state workshops are filling to capacity, and all around the blogosphere and in the world of Twitter you will find people asking questions and seeking information and resources. School counselors want to know how they, too, can receive national recognition for a comprehensive school counseling program. Whoa, slow down there, partner. First you will need to develop and implement your comprehensive school counseling program. People will often ask me, "So, you're RAMPing this year?" My answer is that we've actually been RAMPing for about four years, this is simply our data-collection year. You see, RAMP is ideally not a one-year, one-time process. As with many things in life, the end is not anywhere near as important as the journey you will take to get to that end. RAMP really serves as a capstone, the cherry-on-top of a sundae that has many layers (preferably a few that involve chocolate) and that has taken time, effort, failure, and sometimes major philosophical shifts to build. The most important part of this process is the transformation that takes place in you, your team, and your school community as a result of implementing data-driven practices and creating a program that works with, targets, and benefits all students. We, as school counselors, know that change is often scary, and that it can take people a while to buy-in and get on board with things that are new. This will extend to your own counseling team, as well as your entire building, depending on your current school climate. If you have no or few components of a comprehensive program already in place and you try to suddenly complete a RAMP application in one year, you run the risk of meeting with a great deal of resistance. Additionally, you may succeed and have a recognized program, but if no one else in your building or community has really bought into the comprehensive program or fully understands it, how far have you really come? So, you're excited about RAMP and interested in taking on the transformation of your program. Where exactly do you begin? Get a model. 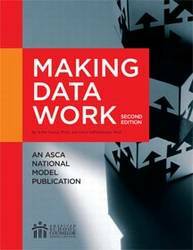 By model, I mean the ASCA National Model, 3rd Ed. In this revision, they have really streamlined the information and turned much of it into more of a working document, filled with templates and worksheets to get you and your team thinking and working on specific elements, such as mission, beliefs, and achievement gap programming. Becoming familiar with the model will help you to begin wrapping your mind around what a comprehensive, data-driven program looks like. One of the additional benefits of the new model is that there is both a print edition and a digital edition. Both come with access to templates and worksheets, but the digital edition also has video clips and links to additional resources to further explain and enhance content. Educate yourself on the RAMP process and seek out resources. ASCA has many, many resources to include articles and examples of other RAMP applications so that you are able to see what the expectations are. One article serves as a checklist to see just how far along in the process your program is and whether you are yet ready to apply for RAMP. Additionally, there is a link to a monthly checklist for those entering their data-collection year. Even if you are not there yet, it can give you an idea of what sorts of components need to be in place for a strong application. Additionally, for those who would like professional development, there is an archived webinar through ASCA about the RAMP process, a podcast about developing a comprehensive program, multiple discussion threads on ASCA Scene, and if there is enough interest in your area, you can schedule an in-person training. In fact, some of these trainings have already occurred in Maryland, Georgia, and Texas--keep your eyes and ears open for one that may be close to you. Take a deep breath...or five. If you have done the two steps above and a lot of the information was unfamiliar, you might be feeling overwhelmed. Remember, transformation is a process and it takes time. You should not expect to have all these things done overnight. We'll talk more about where you start in a bit. Seek mentoring. If you are fortunate, you are in an area where other schools have RAMPed or you have a district that is working to implement comprehensive school counseling programs across the board. If this is the case, you probably have support and mentors close to home. However, what do you do if you if you're in a rural district or in a place which has not yet even heard the whispers of the ASCA National Model? First, I would recommend looking to local and state school counseling organizations. There may not be anyone locally to turn to, but there is more than likely someone at the state level who can help to connect you to another practitioner who can give you thoughts and feedback. Even if this person is not local, use technology like Skype and FaceTime to chat face-to-face over the internet. Additionally, there is support from online communities such as Twitter through the monthly #scchats that occur. In fact, Dr. Erin Mason will be moderating a chat on Tuesday, December 4th, 2012 at 8 p.m. ET specifically about the RAMP process. People are out there to help, whether close-by or across the country. Build relationships. This may seem an odd step, but really, you cannot possibly create a comprehensive program or go through the RAMP process without buy-in from stakeholders. If you are part of a counseling team, you will need to have the support of your whole team in order to move forward, and oftentimes team members are at very different places with regards to a data-driven program. If you are the lone counselor in your building, you will need the support of your administration, teachers, and other support staff in your building to make this happen. Collaborative team meetings with your counseling colleagues combined with advisory council meetings that engage parents, students, teachers, administrators, and community members are vital to beginning to educate people about why comprehensive programs are important and the impact they can have on student outcomes. The ASCA Model is a great place to start with ways to engage stakeholders and begin to tackle the foundation upon which you will build your program. Speaking of which...where do you begin? Everyone has to start somewhere, and I must state again that trying to do all of this at once is probably not the best choice for long-term, sustained transformation with community support. You will know your own situation and school culture best, but the place to begin is with the foundation--Mission, Vision, and Beliefs. These three things will really help to define and determine the rest of your program, as everything you do, from programs to closing achievement gaps to developing small groups will need to somehow resonate back to these three components. Next, if you have never collected data before, pick a program or two to really focus on, gathering data before and after the intervention and sharing that information with stakeholders to show the impact of that intervention. Start small so that it is not overwhelming, but even if you only get information on one or two lessons or groups, by quantifying what you have done and reflecting upon it and what it means for the future, you will have truly begun to examine the effectiveness of what you do. It may be that as a result of this, you realize that something you have done for years does not have the impact you thought it did, so maybe you should instead focus more of your time elsewhere. Likewise, it may be that a program turns out to have a strong effect beyond what was ancitipated, in which case it might be time to expand or invest more resources. This information can be so powerful, especially if the data is tied directly to student achievement (grades, test scores, graduation rates)! Beyond this, the annual agreement is a great document to really connect what you do with your administration and can serve as a launching-off point to demonstrate where your time really goes versus what may be more effective or ideal. You can use this document to perhaps negotiate removing some non-counseling duties in favor of tasks that have you working directly with and/or for students. Finally, doing a targeted needs assessment of students, teachers, or parents can give you some data to help point you in the direction of where you should go next. For example, if you are trying to determine what groups you are going to run this year, pick a random sample of students (and parents, depending on the age) and poll them to see what the needs might be. You might be surprised to find that something that you perceived as a huge need is not even on the radar, whereas something else might rise to the top that you hadn't really considered. By starting small, building key relationships, and making a plan over the long-term that slowly adds components of a RAMP program over time, you will find yourself in your own data-collection year before you know it. Remember the time when you wrote the bulk of your recommendation letters and secondary-school reports in December? The world would stop moving as you tried to encompass the academic and community careers of all of your seniors in writing, attempting to add some depth, humanity, and warmth to the cold black-and-white statistics on transcripts and standardized testing reports. You longed for February, when the bulk of them would be done, and you would move on to the equally monumental task of advising students about course choices for the following year. If you are like me, you have noticed that those days are long gone. December, in fact, has, every year, become much less of a whirlwind, allowing me to even sit back and enjoy the cocoa on occasion. Instead, trying to talk to me in October is just about impossible. For the last two years, almost half of the seniors on my caseload have applied either early decision or early action to colleges and universities. This means meetings with parents and students right as school begins, and then a non-stop flurry of interviews, conversations, and writing. Lots and lots of writing. True or False? Early action and early decision are the same thing. False. Both early action and early decision applications will typically be due by November 1st, and student will usually receive a decision by mid-December. However, early decision applicants can only apply to one school early. They must apply to other colleges and universities using the regular admissions deadline. Early decision is known as a binding agreement, meaning that if that student is accepted to the one school to which they applied early, they will withdraw all of their other outstanding applications and agree to attend that school. Note that this would be in advance of seeing a financial aid offer. Early action, however, is typically not a binding agreement (read the fine print, though, on college admissions websites, just to be clear). Students receive notice in mid-December, just as in early decision, but they are not bound to attend the school, giving them time to receive decisions from other schools and compare financial aid packages. Many schools have moved towards early action versus early decision for this reason. True or False? Any student should feel comfortable applying early decision or early action. False, but with a lot of caveats. The reason I wanted to do this particular post is that it seems as if the answer to this question changes each and every year, or at least I feel it does. Even five years ago, early decision/action was really reserved for those elite students whose statistics (GPA's and test scores) were above the school's admissions pool average. This was because the typical early application pool was full of more high-achieving (statistically speaking--numbers only) students, and in order to be competitive in that pool, students needed to be towards the top of the pack. Then, in the last several years, the number of early applications has grown leaps and bounds. This has increased the pool quite significantly, and we see more and more students who fit the average admissions statistics of a school applying early. Further, in phone calls and conversations with admissions counselors in the last two years, they have stated to me that if a student has a real passion for attending their campus, they would like for them to consider applying early. Applying early can be a sign to a school that the student is extremely interested in attending their campus next year. However, I would still recommend that students only apply early if their statistics fall into the average or above for a given school--more on why that is important in the next section. Additionally, any student applying early decision must be 100% sure that this is the college or university they want to attend, above all others, which means they have visited the school, have a feel for the campus, know that the campus has their major or many majors within their general area of interest, and that they feel they can reasonably afford to go to the school financially. One very positive trend in early applications is the increase in diversity of the applicant pool. A Forbes article discusses how colleges and universities are actively encouraging and recruiting students from minority groups and from low-income households to consider applying early, allowing a wider group of students to access this particular service. Are 100% sure that the college is their first choice (a MUST if applying Early Decision). Knows the school is a strong match academically and socially. Meet or exceeds the average basic statistics (GPA, test scores, class rank if available) of the general applicant pool. You should not feel pressured to apply early just because other students are. You should not apply early decision if financial aid is a large consideration and you will need to compare aid offers. True or False? Students can expect a response of accept, deny, wait list, or deferral to the regular applicant pool. True, but this is where it can get tricky. Students can certainly be accepted or denied through the early process, and there have been several articles discussing how some colleges and universities are admitting a larger percentage of their early applicant pool than their general pool, overall. For example, Bucknell admitted 65% of its early applicants as opposed to 30% of its overall applicants. This US News and World Report article points out a list of schools where applying early action helps students. However, I would again caution people to consider that the early applicant pool may look very different than the general applicant pool, as many of those applying early tend to meet or exceed the average admissions statistics for that college, making colleges or universities more likely to accept a greater percentage of them. I would think very carefully about recommending that a student apply early to a school on their list that is a "reach" school because their statistics are under the average for a school. Another trend that it is important to consider is that of deferring applicants to the regular pool. It used to be that if the college was not completely sure about an early applicant and wanted to see them as compared to the regular application pool, they would defer their decision until after the regular application deadline. Indeed, many of my students felt pretty safe applying early, because the general feeling was that if they were not accepted, they would probably be deferred to the regular pool where they could get another review. However, through a conversation with a parent and then an admissions counselor at one of our area colleges, I have discovered this trend may be on the wane. Indeed, more schools are trying to make a final decision on an early applicant versus deferring them to the regular admissions pool, as discussed again in this recent Forbes article. Thus, some schools are simply giving a decision of accept, deny, or wait list, just as they would for applicants to the regular pool. This should serve again as a caution to advise students to take a strong look at their black-and-white statistics in order to insure that they meet that school's averages, as it may be less likely that they will get a second review in the regular applicant pool. True or False? There are ethical guidelines and standards to guide both us as counselors and our students through this process. True! For counselors, there are guidelines from College Board about advising students properly about early decision, such as letting them know they have to withdraw all of their other applications if they are accepted and that they are only allowed to apply early decision to one school. They also discuss the process for students who apply early but do not receive the financial aid necessary to attend, but that should be part of the conversation you initially have with a student before they apply early, because if that is a major concern the early application may not be the best choice. There are also guidelines for secondary school professionals from NACAC on page five of their Statement of Principles of Good Practice. For students, I would highly recommend sharing NACAC's Students' Rights and Responsibilities in the College Admission Process--it is available in both English and in Spanish. It details what students and families have a right to expect in the college admissions process, but also gives guidelines about their ethical responsibilities in the early admissions process. Overall, though, each college and university is going to have a unique process and a unique set of standards by which they evaluate early applicants as well as in the types of decisions they give. If you are looking for statistics on the percentage of early applications admitted at a given school, I recommend going to College Data, entering the school, and clicking on the admissions tab, or you can try to navigate the websites of individual colleges. If you have specific questions about the process at a school, please pick up the phone and give the admissions office a call. I have always been met with admissions counselors, assistant deans, etc. who have taken time to answer my specific questions--it benefits my students, as they get the best guidance possible for that particular school, it benefits me, as I am able to relate up to the minute advice and information, and it benefits the colleges and universities, who are then able to receive applications from students who are well-informed about the process, their own chances, and the possible outcomes. If you have students that are interested in participating in Ally Week, note that October is National Bullying Prevention Month and that perhaps Ally Week could be incorporated in some way into programming that may already be in place. It does not necessarily have to be that you use cards and badges, but it is important to acknowledge that anti-LGBT slurs and bullying will be taken as seriously as all other disparaging language and actions. As I've discussed before, programs such as Ally Week can be important to the academic success of LGBT students. As the latest data from the 2011 School Climate Survey shares, LGBT students who have schools with supportive adults in the building have higher GPA's, are more likely to pursue higher-education after graduation, are more likely to attend school, and are more likely to feel safe when in their school building. (source: www.glsen.org). Thus, interventions within the school that are supportive of all students' rights to be in a safe and supportive environment, including LGBT students, can have long reaching effects into your school's outcome data in addition to the health and well-being of your students. Think back to when you first started your job as a school counselor. For some, that may have been 20 years ago. For others, that may have been last week. You would have recently finished a graduate program in school counseling, complete with an internship that provided you with real experience working in the schools. All of this prepared you to be a rock-star school counselor. Your education was complete--you knew it all. Perhaps not. If you were more like me, you sat in your first meeting with the other counselors in your school, two weeks before the students started back, being given task after task, data report after data report, having no earthly idea of a) what they were talking about and b) how to do the things they were asking of you. I'm pretty sure I had a look of sheer panic on my face, as one of the my colleagues came up to me afterwards and reassured me that they knew how I felt and that they would sit down with me the next morning and help me work through the list. No matter how strong our graduate programs were, and no matter how much a part of the school team we became when we did our internships, there will always be a learning curve when new school counselors start their very first job, just as there is when new teachers start teaching. There is a huge difference between being somewhere a few hours a day or a few days a week, having a small select population of students that you work with, and then suddenly having a real case-load that is all your own, with no supervising counselor to serve as your buffer when things don't always go according to plan. Often you are suddenly trying to map out your calendar for the whole year, learn a new student database program, and pull together the five classroom lessons, all for different grade levels, that you are required to teach the first week as part of the rotation in an elementary school. Never mind trying to forge relationships with teachers and figure out how you and your administration are going to function as a team. Oh, and by the way, you're in charge of the school's mentoring program. And we're also going to need you to develop a school-wide bullying program that the Superintendent wants in place by the 2nd week of school. And the PTSO board wants to meet with you to talk about the winter-coat drive you will be assisting with starting in October, and they need you to bring estimated numbers of students in need and expect you to have found a place for them to store the coats within the school through December. You can barely find your office, let alone all the nooks and crannies of your school where you could store 200+ winter coats. I have to agree with this statement, not only for teachers, but for new school counselors, as well. Our education and learning does not end with our graduate degrees. Far from it. Rather, we need continued education, supervision, and connection to resources as we go through our first several years, not to mention our entire careers. Dr. Dale also mentions that if there is some sort of support in place, such as coaching, that the time for a teacher (or counselor) to become proficient is reduced. This is because clearly defined support services can more quickly identify areas of need and growth within a new school counselor and then develop targeted interventions that will help to strengthen their skills and performance in a much shorter period of time than if they were simply left to figure things out on their own. If you are able to get right to the heart of the matter, address it, and move on, things are bound to happen more quickly. Mentoring: All new counselors should have a mentor, within their buildings if at all possible. The mentor is the person who is most able to develop that strong one-on-one relationship with the new counselor and help to troubleshoot anything that may come up on a day-to-day basis. Further, if the mentor is another counselor in the same building, they will be able to help the new counselor build relationships with the other school staff, as well as help to solve problems in a way that is congruent with the specific school culture. Additionally, the mentor is the person best able to assess areas of strength and areas for growth in the new counselor and help them to practice and develop new skills that will assist them in becoming a stronger professional. This component is key--new counselors have come out of graduate programs where they were receiving regular supervision of their practice within schools, and it is essential that they continue to receive supervision support within at least their first year of work. Mentors should not be responsible for any part of the new counselor's evaluation--they should be seen as a support, not as punitive. If it is feasible, training and support should be available for mentors to assist them in their work with new counselors. Connection to Resources: No matter what school district or location the new counselors are in, they will need help learning what resources are available to them within the schools as well as in their communities for their students, and their students' families. Within school systems, these can include alternative programs, the process for identifying and supporting students with special needs, information on the curriculum and how it is sequenced within your school system, and internal crisis procedures. Outside of the school system, counselors need information on social-services (housing, clothing, food) as well as referral options for mental health to include those that are free or on a sliding scale. Further, school counselors need nuts-and-bolts education on how procedures work within their schools and within their districts, everything from calling Child Protective Services (CPS) to assessing and notification for suicide risk. This information can be disseminated in multiple ways--we have meetings throughout the year with the new counselors where this information is presented, usually by the people in charge of or connected with the resources themselves. How can you begin to identify what resources need to be shared and when they should be presented? Consider giving a needs assessment to some of the newer school counselors in your district--what would they have liked to have had information on and when would it have been helpful? You can also look at the calendar of the year and determine what topics are most needed at a given time--curriculum information is probably best before academic advising season, whereas the special needs student information specific to your district may need to be fairly early. Continuing Education and Skill Development: As I wrote about above, you learn a lot in your school counseling graduate program, but every new school counselor is continuing to build their skills as a professional. 20 years ago, almost all school counselors had been teachers before they became counselors. Now, if your district is similar to mind, about half of new school counselors have never been in the classroom. This is not a negative--these career-switchers bring an absolute wealth of knowledge and experience from such areas as the private sector or the military. However, they have a steeper learning curve when it comes to learning the structure of a school as well as essential skills like classroom management, lesson planning, and developing assessments for when they have to step into the classroom. Most graduate programs do not include the topic of college advising and admissions in their curriculum, yet for high school counselors, this information and knowledge is imperative. Additionally, in almost every district and school in the United States, school counselors are seen as leaders and are expected to facilitate team meetings, parent conferences, and serve on or lead school committees. These types of leadership and management skills, even if they were addressed in graduate school, continue to need honing as school counselors transition into full time work in their buildings and begin to apply them to real-world situations on a regular basis. Again, there are many ways to work this into a program of support for new counselors--we have joined forces with our program that supports new teachers, known as Great Beginnings, to teach classes after-school on a monthly basis that cover many of these topics for our new school counselors. They work together as a cohort through a variety of activities designed to get them thinking about their practice as well as learn new skills. Again, if you are trying to determine what some of the skills should be for a program in your district, consider doing a needs assessment of not only recent new counselors, but also from Directors of Student Services/School Counseling in schools and perhaps even administrators (in elementary schools). As the people responsible for evaluating new counselors, they may have noticed patterns over the the last several years that a program of education could help to address, for example a need for more work on classroom management skills. If there is currently nothing in place and you need to pick one thing to start with, choose mentoring. That one-on-one connection with another school counseling professional, even if that person is in another building, is the most important thing, in my opinion. New school counselors, especially if they are by themselves in a school, need to have someone they can pick up the phone and call to discuss the often very confidential and ethically-gray situations that we tend to run into. They need at least one other professional in their world that understands the specific challenges of being a school counselor that they can turn to in order to problem-solve, from whom they can get a resource, or someone they can just vent to when things have not gone particularly well. It is important, when mentoring, to maintain appropriate safeguards with regards to confidentiality, especially if you are in a smaller town or district. Avoid names, if possible, in your discussions, and make sure that you are not having conversations about sensitive topics in public places like coffee-shops and restaurants. Further, even if the mentor is not in their particular school, they are at least in the same school district, so they will have some knowledge of how things tend to work, in general. Mentors automatically connect new counselors to internal and external resources, as well as help to teach new skills on an individualized basis. Hopefully, whether formally or informally, there is already some form of this in place in your district. If not, maybe you are the one to start it? We have mentoring. Where do we go from there? You may be ready for a mentoring "extension." Consider formalizing your mentoring program with a month-by-month list of items to cover (which, again, can include resources and skills building) and even some review of data to determine goals that fall in line with the ASCA National Model. For an example, take a look at Delaware's school counseling mentoring program, complete with checklists of items to be covered. If you do not have the resources or personnel to develop separate programs to share resources or continue education, build some of it into your already existing program. There is no one to coordinate and facilitate a separate program for school counselor development. Further, there is no money to pay for the extra time it would take to develop such a program. Believe me, I understand this concern. Many districts do not have someone in their central offices devoted exclusively to school counselors, and in a challenging economy there is not a lot of "extra" floating around out there to develop new programs. You might see if there are any grants available for your needs, but this may be hit or miss. You have to know your own school and district and just how flexible things may be. Perhaps you can volunteer to head up a mentoring and class effort in exchange for a reduced case-load of students. Maybe you can negotiate one-day off a month to work at the central office to develop and manage the program. If none of these things work, there is another currency with which schools can reimburse you for your time--continuing education units (CEU's). Each state asks for a certain number of CEU's to re-up certification every so many years--perhaps you can more than make your quota by being reimbursed with points for developing a program for new school counselors over the course of a year, and then getting some each year as you maintain it. Additionally, if there is a program of support for new teachers (and many districts have such a program), how is that being supported, and is there any way you might be able to garner support through that program? None of these may ultimately work, but it may be worth asking a few questions and proposing a few ideas to see what may be possible. We have a strong mentoring program, but some new counselors are getting a good education when it comes to resources and some are not. We are not going to be able to meet on a regular basis to go over them, but they are essential. What should we do? First, you could strengthen the mentoring program even more by working these resources into the program--if all the mentors are required to go over special needs students during the second month of school, chances are higher that there will be more consistency across the board. Beyond that, consider creating a School Counseling Resource manual that is updated regularly with procedures, internal resources, and external referral sources. In this world of technology, consider doing this electronically through a shared internal drive, through a school counseling Blackboard or SchoolFusion website, or on a flash drive given to new counselors. You could also consider creating videos that walk new counselors through various resources that they can watch together with their mentors, or you can use programs such as Prezi to create presentations that will educate them on what is available in your district and make sure that everyone is getting the same message. We do not have the resources to develop our own curriculum for continued education and skills development. What might be some other options? First, check out what speakers and experts are available within your building or district. If you are looking for some professional development on lesson-planning, you may be able to have a colleague who is a teacher lead a session on that topic. There are probably people who already have things prepared and ready to go that would be happy to partner with you. However, there are a lot of options out there with regards to pulling things up for free to work on with new counselors. First of all, the ASCA webinars are free to members. Take a look at the schedule there and pick out a few that seem relevant to your school and/or district. Then, watch them with the new counselors and follow up with discussion and ideas for how to incorporate some of the concepts discussed into their practice. Topics this year include classroom management, bullying, technology use, and leadership--perfect for new school counselors. Another great website for webinars is the National Office of School Counselor Advocacy (part of College Board)--check out their events page for upcoming and past events that you can access. Another resource would be the plethora of school counseling blogs that are out there--find some entries that get to the heart of things like classroom management, lesson planning or academic advising and discuss them as a group. You can find a pretty complete list of blogs at the School Counselor Online Professional Exchange (SCOPE) as well as some great tech ideas. Additionally, there are monthly school counseling chats on Twitter (1st Tuesday of the month, 8 p.m. ET) that cover a variety of topics. A great idea might be to have all the new counselors in your district hop on together for these chats and then follow up with a discussion of the topic as it might relate to your district. There is also ASCA Scene, the school counseling discussion board--start a thread with the new counselors in your district and see where it goes, getting input and feedback from school counselors from around the world. Perhaps you can find some time to gather everyone together for some topics, and enrich the experience with some of these options provided by technology--get creative! As we have a unique role as school counselors within our schools, we need unique and tailored professional development, especially in those first years, that speak to our specific skills, needs, and challenges. It is our ethical responsibility to "provide support, consultation, and mentoring to novice professionals." (ASCA Code of Ethics, F.2.b) My hope is that by focusing on mentoring, connection to resources, and continuing education and skill development, you can work within your school and district to build and design a program that works for you to "shepherd" in the next generation of school counseling professionals. I must absolutely acknowledge several people and entities that I have the privilege of collaborating with in our work with new secondary counselors in my district: Marcy Miller, Valerie Hardy, the entire FCPS Great Beginnings staff, and my partner-in-crime, Deborah McDonald. I am able to write about this topic only because I work with such outstanding people.